1 — What differentiates it from its competitors? 2 — What products or services to offer? 3 — In which markets and market segments to operate? 4 — Who are its best potential customers? 5 — How best to reach these prospective customers? 6 — How best to convince prospective customers to buy its products and services? A good business development plan lays out the answers to these questions plainly, with specific actions, dates and cost estimates. Without good answers to these questions, expenditure on websites, brochures, advertising and selling activities is often wasted. We use a set process and very experienced consultants to create the Business Development Plan. A key objective throughout the planning process is to produce substantial results quickly, while taking up a minimum of our clients’ time and money. As the chart below illustrates that the cost involved in creating an effective Business Development Plan is very small in comparison to the amount of money that can be wasted on subsequent activities in the sales process. Please see our Guide to Getting the Most Out of a Limited Sales & Marketing Budget to understand how our Business Development Services are often linked to our Website Design, IT, Marketing Communications and Sales Assistance Services. 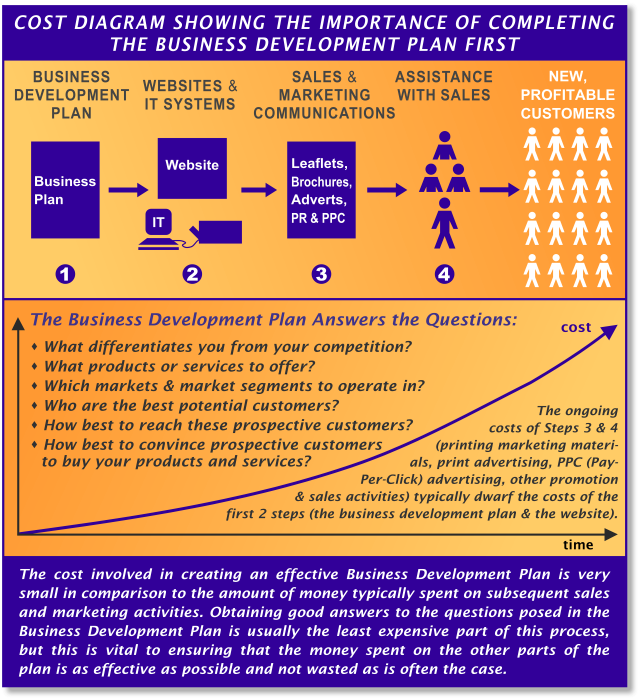 Or better yet, please open this Pdf Diagram of Our Business Development Services. If you are interested in our Business Development Services please telephone us on 01225 480325 or use our contact form to arrange a free discussion. In most instances we should be able to give you an estimate of the cost and time for your particular business at the end of the meeting.